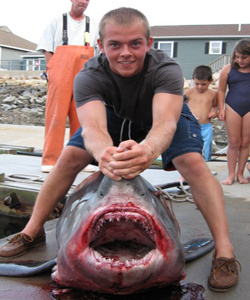 Shark Fishing Charters in Massachusetts. Fishing charter boats for shark along the shores of Cape Cod. This is the best place for the real monster of a shark it's the home of Jaws. The waters surounding Mass Bay and the Gulf of Maine are full of world record size sharks from July through October. Shark fishing trips to Wildcat Knoll and Stellwagen Bank are a full day adventure. Our method is chunking and chumming this is what it takes to get the sharks to frenzy at the boat. 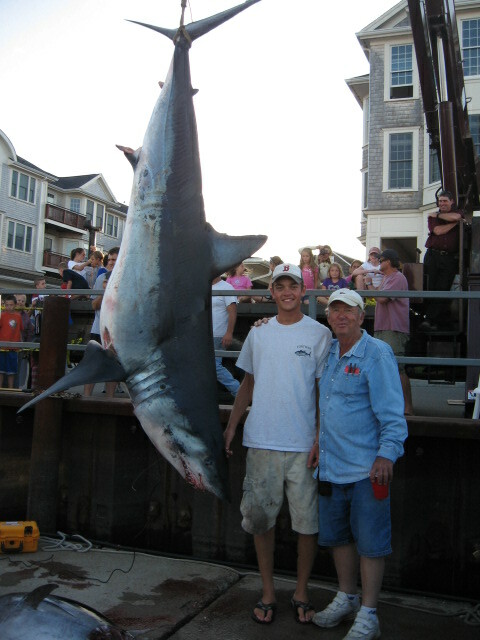 Mass Bay Guides captains hold a scientific world record for largest "Male" Mako Shark ever recorded. Our captains also hold 2 Governors Cups for Sharks. Massachusetts is one of the best places for a monster shark charter fishing trip. Remember the movie Jaws, it was filmed in MA, sharks that size do exist. You could catch sharks as big as 1000 pounds. Fighting a monster shark can be the ultimate in man against beast adventure. No experience is necessary to catch a shark with us. You will be venturing out with our experienced crew to learn proper handling techniques and avoid potential problems. Common Sharks in our area include Mako sharks, Thresher sharks, Porbeagle sharks and Blue Sharks. Great White sharks are also commonly prowling the shoreline after their favorite food seals. We are not allowed to catch Great Whites but they have been known to follow the chum slick and make an appearance. Most Sharks are released unharmed although you may keep edible species for your own consumption. Sharks caught in tournaments are donated to science and to feed the poor. We offer childrens shark fishing close to shore they catch dog fish sharks up to 4 feet long see our childrens adventures for more information. We can combine shark fishing with Tuna fishing and Bottom fishing. 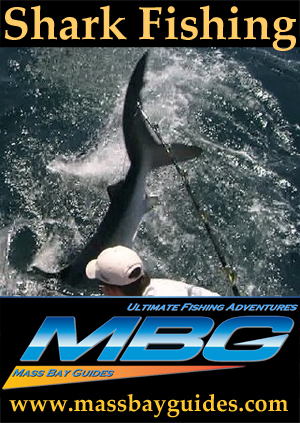 We are a known worldwide as a great shark fishing fleet and we love to fish, so come shark fishing with us!
! Live Video Fishing reports Click Here ! We Combine Shark fishing with Cod fishing, Tuna fishing, Haddock fishing, Striped Bass fishing, Mackerel fishing, Halibut fishing, Whale watching. Mako's are the more aggressive of the shark fish and will put up an exciting fight. considered to be the Marlin of the shark species. 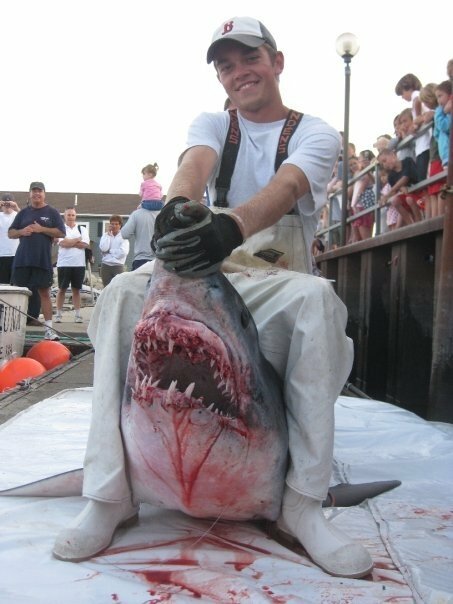 Mako's are know to be a man eater so Venture with an experienced shark angler to prevent unexpected surprises and make sure you bleed and ice the shark flesh immediately. Anglers are encouraged to release sharks not intended for consumption. Porbeagle's look allot like a great white but have a prominent white patch at the bottom of the dorsal fin. Porbeagle sharks are very agresive and will eat live bait as big as tuna. They are probably the best tasting of the sharks in our area. Porbeagles bite so Venture with an experienced shark angler to prevent unexpected surprises and make sure you bleed and ice the shark flesh immediately. Anglers are encouraged to release sharks not intended for consumption. State Records: 455 pounds caught by our friend Capt. Mike Evenson in Mass Bay. The Thresher Shark is probably the most exciting shark to catch these extremely strong animals are able to leap 20 feet in the air one of the most prized of the shark species Threshers are probably the most dangerous shark to capture the tail can knock a man overboard or cut you bad so venture with an experienced shark fisherman to avoid surprise . Blue sharks are common to our offshore waters and are sought after by recreational anglers. Blue sharks have been known to bite humans so venture with an experienced shark angler to prevent unexpected surprises Anglers are encouraged to release sharks not intended for consumption. Most people do not like the taste of Blue Shark. State Record former world record: 454 lbs Captain Steve James our Seminar MC caught in Mass Bay.